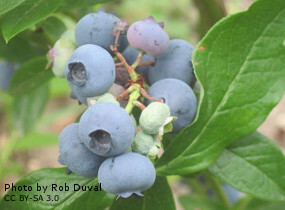 BLUEBERRY, PATRIOT (Vaccinium Patriot). Fruit. Very large slightly flat velvety berries, firm flesh of excellent flavour, delightful aroma. Tolerant of heavier wetter soils and colder weather. Height 4ft (120cm). Plant 5ft (150cm) apart.